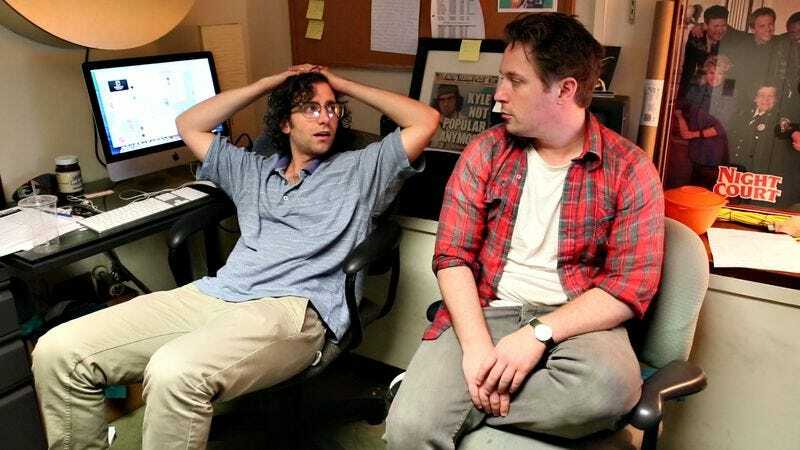 Kyle Mooney and Beck Bennett are the (most recent) kings of the 12:55pm SNL sketch. The sad part about those sketches, though, is that they don’t always make the show. Sometimes they’re cut for time, or because the run-through audience doesn’t laugh as much as they should. But that’s okay these days because now, with the internet, those sketches inevitably end up online, where comedy nerds and SNL haters alike can watch and judge them in equal measure. That’s the case with “Cool,” a newly released sketch that features Mooney and Bennett as slightly off ‘90s sitcom stars who, alongside Ryan Gosling, go on a Weird Science or Stefan Urquelle type voyage to turn Mooney’s “Dougie” into “Dougé,” the “King Of Smooth.” Dougie even has a Family Matters style catchphrase, “Whoops, did I mess up again?” Things don’t end up super well for Gosling’s “Aaron” character, but even the cheesiest ‘90s sitcoms needed to end on a tough life lesson.